Torn started playing in 2000 in Europe first and then expanding to other continents. From Russia to Indonesia, New Caledonia and Japan, she performs worldwide. She played live on B.B.C. 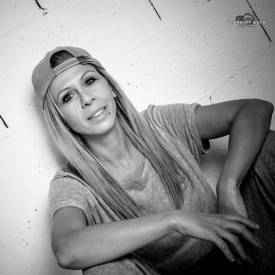 Radio Wales (UK) and was the 1rst foreign djane to play in Doha (Qatar). She was one of the only french djane who played at KaZantip (UA). She ran her CRIMINAL BEAT CARTEL record label for 6 years. Her first EP came out on 2007 with Ben Long & Mike Humphries. She collaborated with Electrixx on CBC 003 "Sexstoy" in 2009. This EP was tracklisted by TRAX Magazine, supported by Laurent Garnier and chosen by Mathieu Denis and Simon Lavoie to feature in the soundtrack of their movie “Laurentie”. The movie has been pre-selected for Cannes Festival in 2011. Torn featured in ELLE magazine in june 2013. In 2016, she collaborated for the first time with the Mexican G-House label Drop Low Records.